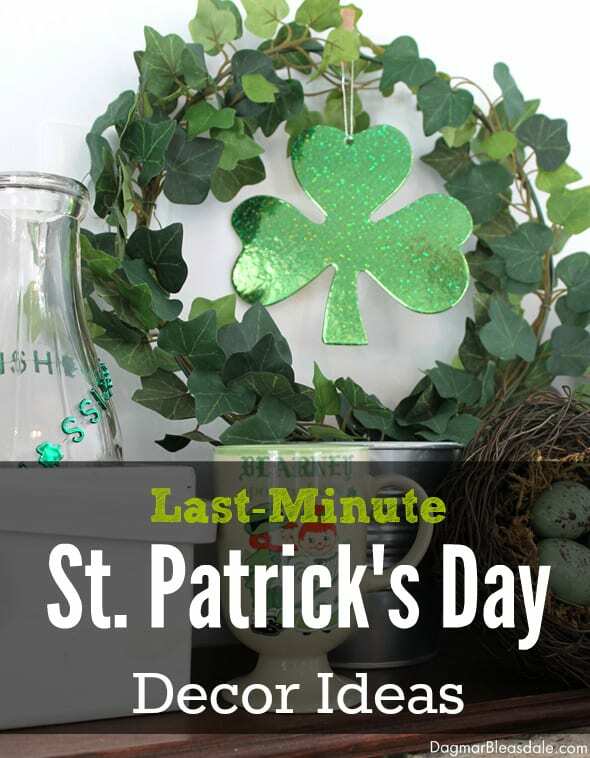 If you are looking for dye-free St. Patrick’s Day snacks, here is one easy idea, and I created a bag topper you can print out to make little gift bags. 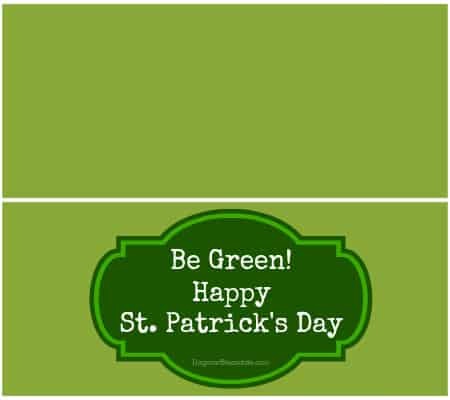 I was searching for healthy snack ideas for St. Patrick’s Day on Pinterest and was horrified that all I could find was treats full of green and rainbow-colored food dyes. Artificial food dyes are really bad for our health, especially for children — food dyes have been linked to cancer, hyperactivity, and allergies. That rainbow-colored cookie might look like fun, but I wouldn’t want my son to eat it, and I certainly wouldn’t make him treats with dyes. 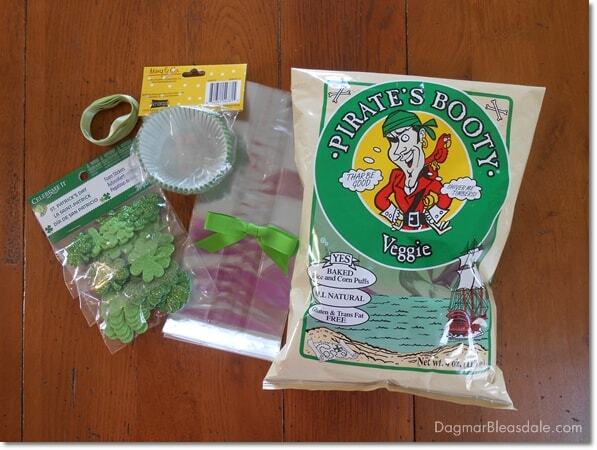 So I came up with health, green St. Patrick’s Day snacks and my own goodie bag topper. 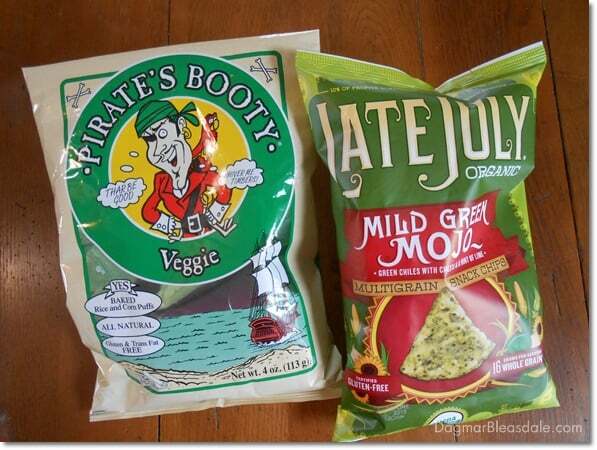 The two green snacks without dyes I could find were Veggie Pirate’s Booty and Late July’s Organic Mild Green Mojo chips. I put some into cellophane bags and stapled my goodie bag topper to it. 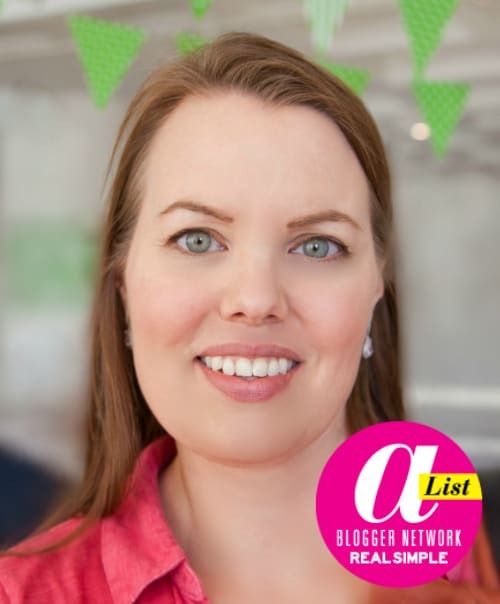 Here is the free PDF for my Be Green! goodie bag topper. Then I added a shamrock sticker I bought. Voila: you have a healthy treat in a pretty bag for St. Patrick’s Day snacks your kids or husband or party guests will enjoy! 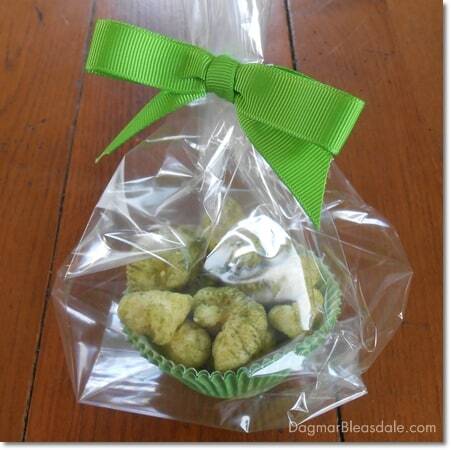 If you don’t feel like printing out a bag topper, here is another goodie bag idea — with green muffin cups and some ribbon. 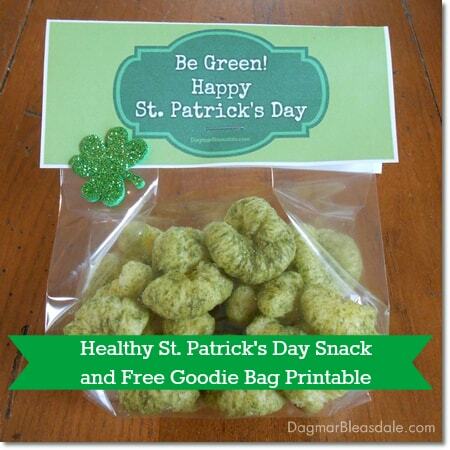 Feel inspired to make your own healthy St. Patrick’s Day snacks goodie bag? Let me know if you do, and what you might use or add to your bags. Cute Printable and healthy snack alternative. Thank you for sharing on Merry Monday! Have a great week! what a fun St Patricks Day treat! 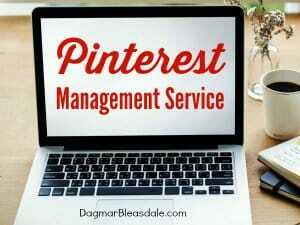 Thanks for linking up at #MerryMonday link party! Just dropping by from the #HomeMattersParty to thank you for sharing your wonderful post! I enjoyed it a lot. Dagmar! Thank you for sharing your creative idea at the Celebrate Your Story Link Up Party! Love this healthy alternative. Hope you and your family are well. 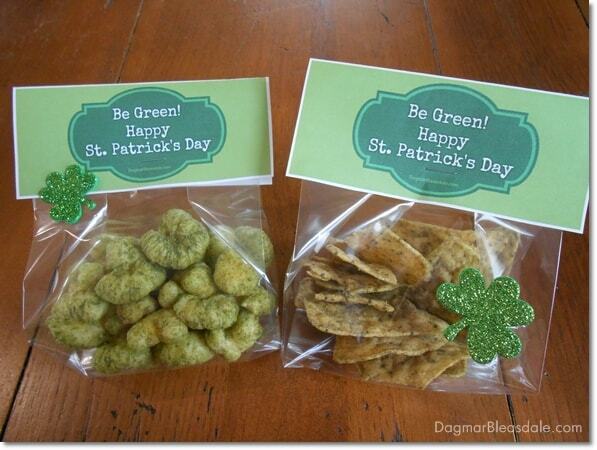 Happy to see treats without artificial colors and for St. Patrick’s Day no less. The toppers are an extra special touch also. We would love for you to share this at Celebrate Your Story link party. Here’s the link: http://www.thesweetsensations.com/welcome-to-celebrate-your-story-link-party/. Hope to see you there! Very cute. Thank you for sharing on Show Me Saturday! Very cute goodie bag!Thanks so much for linking up at Best of the Weekend! Thanks for the pin, Sammi!! Thanks for letting me know, Alison! Thanks for coming by, Mandi!